Bread is an everyday staple for a lot of people. Yet finding a loaf that is light, tasty, with added fibre can be hard. Look no further my friends, as I present my Lighter Wholemeal Loaf. I must admit I am a bit of a ‘bread head’ – does that make me sound cool? By that, I mean that I adore most breads, providing they are well made, do not contain additives and have a flavour of their own that contributes to the final dish. I do not live near an Artisan Bakery, where freshly baked bread, in all its array of shapes and flavours can be purchased. So instead I make our bread at home. 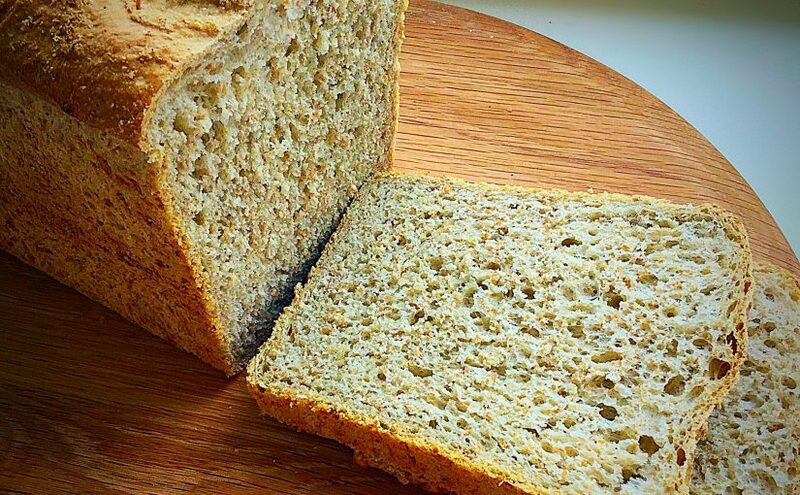 Lighter Wholemeal Bread full of flavour. 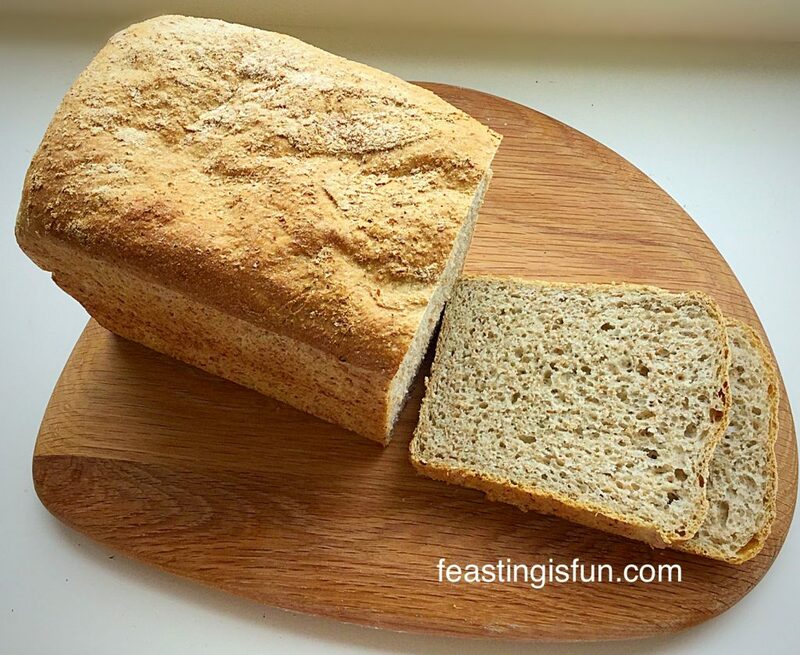 This Lighter Wholemeal Loaf is one of our family’s favourite breads. 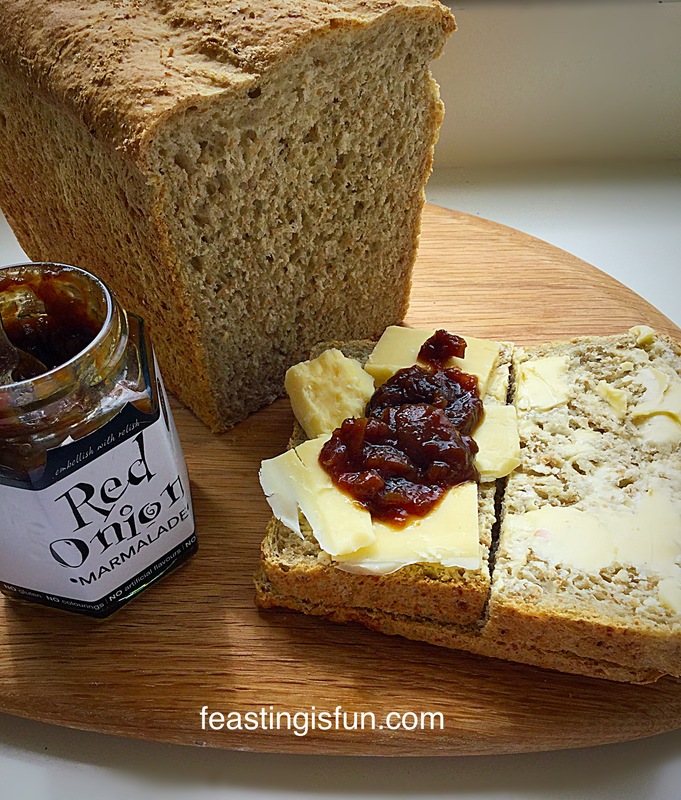 The loaf slices beautifully and so is perfect for packed lunches, or toasted for breakfast and then slathered in homemade jam. 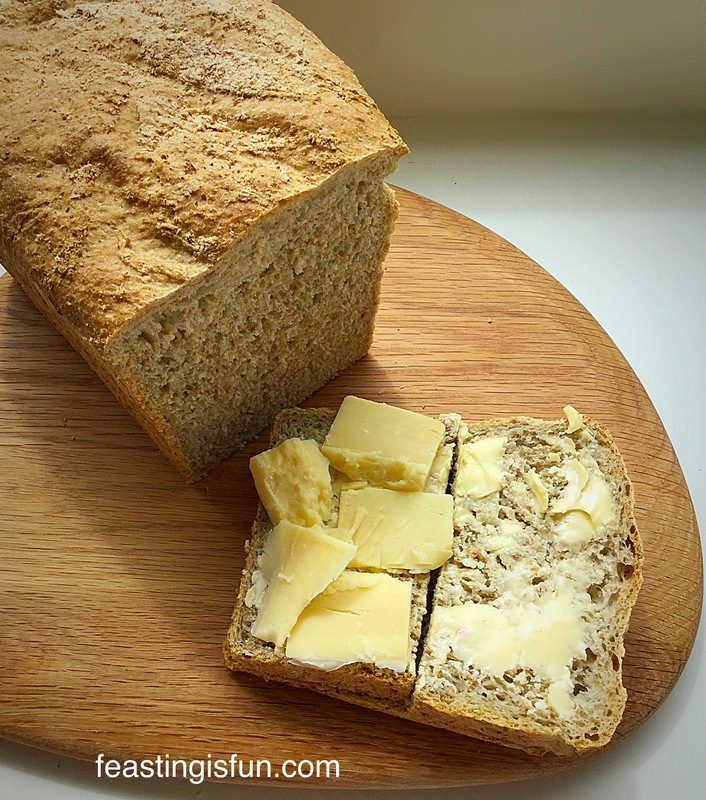 I have 100% wholemeal bread recipes such as my Wholemeal Cob Loaf and Wholemeal Loaf, yet if I’m honest, as delicious as they are, having the same bread every single day can get a bit boring. So I like to switch things up a bit, keeping our taste buds interested and in reality, ensuring our teenagers eat a decent portion of their lunch. Lighter Wholemeal Loaf just add butter for a delicious feast. When I eat bread I want it to contribute to the flavour of the whole dish. What I mean is, it shouldn’t, mustn’t, just be a limp carrier for other flavours. The mature cheddar cheese and butter, as seen in the photo above, became my lunch yesterday – the perks of being a food blogger! Yet this sandwich, with the addition of some Red Onion Marmalade, truly is one of my favourite lunches. While each component adds flavour and different textures, so that as a whole, the resulting sandwich was incredibly appetising and filling. 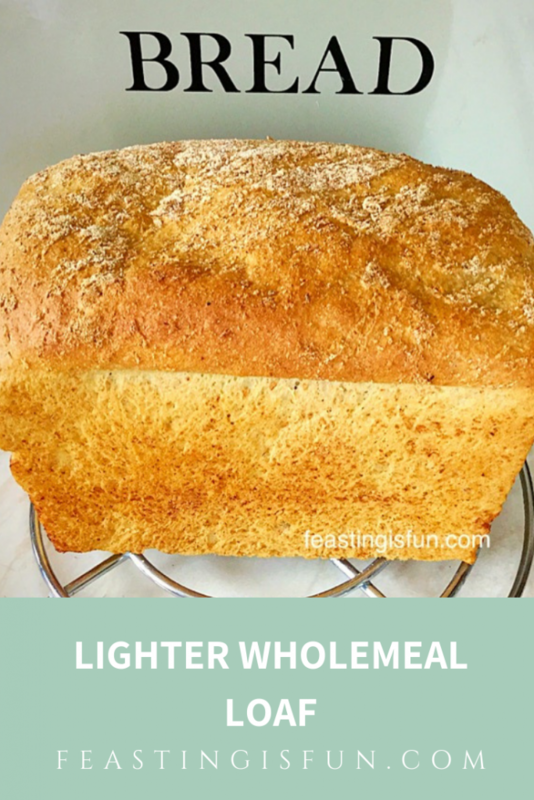 Lighter Wholemeal Loaf a hearty, flavour packed lunch. I used a mixture of stone ground, organic strong flour from Shipton Mill to make this Lighter Wholemeal Loaf. The wheat, traditionally milled, using the flow of river water for energy needed to drive the grinding stones, is consistently excellent, while it’s production is sympathetic to and works in harmony with the environment. So that I can guarentee you consistent, excellent results when making this Lighter Wholemeal Loaf, this recipe has been thoroughly tested, with the resulting loaf being approximately one third wholemeal flour. A 2:1 combination of Strong White to Strong Wholemeal flour gives a great, nutty, wholesome flavour, whilst keeping the bread light enough for everday use. And it is a great way of adding extra fibre into your own and your familiy’s diet, especially if their preference is for white bread. 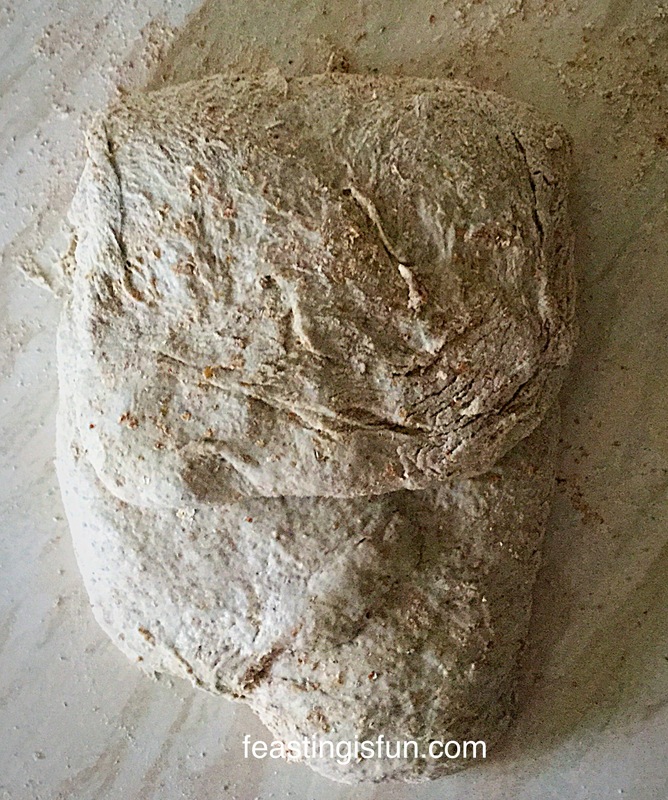 150g/5oz Strong Wholemeal Flour – preferably organic plus a little extra for dusting the work top. The ‘bowl’ is either a large bowl, with which to mix the bread by hand, or the stand mixer/bread maker bowl. First of all, pour the water into the bowl. Add the honey and yeast. Swish about with clean fingers to activate the yeast. Now add the flour on top of the liquid. Add the salt and the butter. When using a bread maker, set to dough cycle and start the program. As soon as the cycle is completed re-start for 1 minute. This ‘knocks back’ the dough. If using a stand mixer, attach the dough hook and mix on medium speed until the ingredients are combined. Continue to mix for a further 5 minutes, until the dough is smooth and elastic. Stop mixing. Scrape the dough from the dough hook and combine with the dough in the bowl. Form into a ball, place back into the bowl. Cover with a damp cloth and leave in a draught free place until doubled in size (approx. 1hour). Gently punch the dough to knock it back. Alternatively when hand mixing, bring all the ingredients together with your hand until they form a doughy mess! Place this dough onto a very lightly floured worktop. Knead for a good 10 minutes. If the dough gets sticky, keep kneading and working it – if you add extra flour the finished bread will be dry. After a good 10 minutes kneading, the dough should have a smooth elasticity. Place the kneaded dough into a oiled bowl, cover with a damp cloth and leave in a draught free place until doubled in size, 1-2 hours. Knock back as for stand mixer. To shape the dough: Tip the knocked back the dough out onto a lightly floured surface. Gently flatten the dough into an oval/rectangle shape. 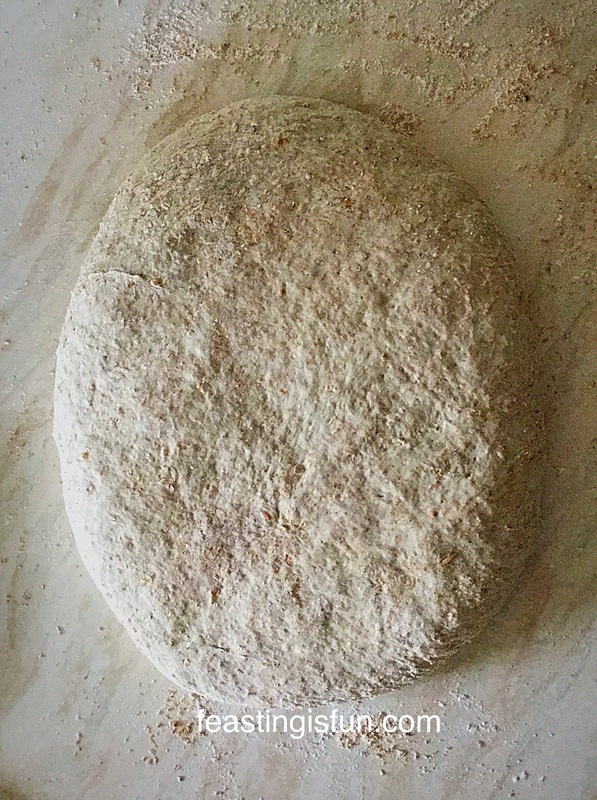 Flatten out the dough into a rough oval. Fold the top third of the flattened dough over. Next fold the bottom third of the dough up and slightly over the previous fold. Bring the bottom third of the dough up. Rotate the dough by a quarter, gently flatten out and repeat the folding process. Repeat the turning and folding twice more, ensuring the last turn and fold is quite tight. This folding technique does not take long and unlike pastry, this bread dough can withstand being moved and worked. Most importantly the purpose of turning and folding is to build a good structure within the dough. Once the folding and turning is complete turn the dough over so that it is seam side down. Place into a greased 3lb loaf tin. Cover with a tea towel and leave in a warm, draught free place until doubled in size. I also sprinkled some wholemeal flour over the top of the dough, this gives a nice, rustic finish to the baked bread. Neat, tightly folded dough ready for its second prove. The dough can take between 45 minutes and a couple of hours to double in size, depending on the ambient temperature and humidity. While the dough has it’s final prove, preheat your oven to it’s hottest setting. 5 minutes before your loaf is due to be baked, fill a tray with ice cubes and place on the lowest shelf in the oven. 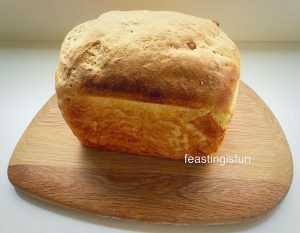 The hot, steamy environment will help the dough to rise even further before the crust sets and helps bake a crusty loaf. Lighter Wholemeal Loaf beautifully risen and ready for the oven. Place the loaf into the centre of a preheated oven and immediately reduce the oven temperature to 220C/200C fan, gas mark 7. 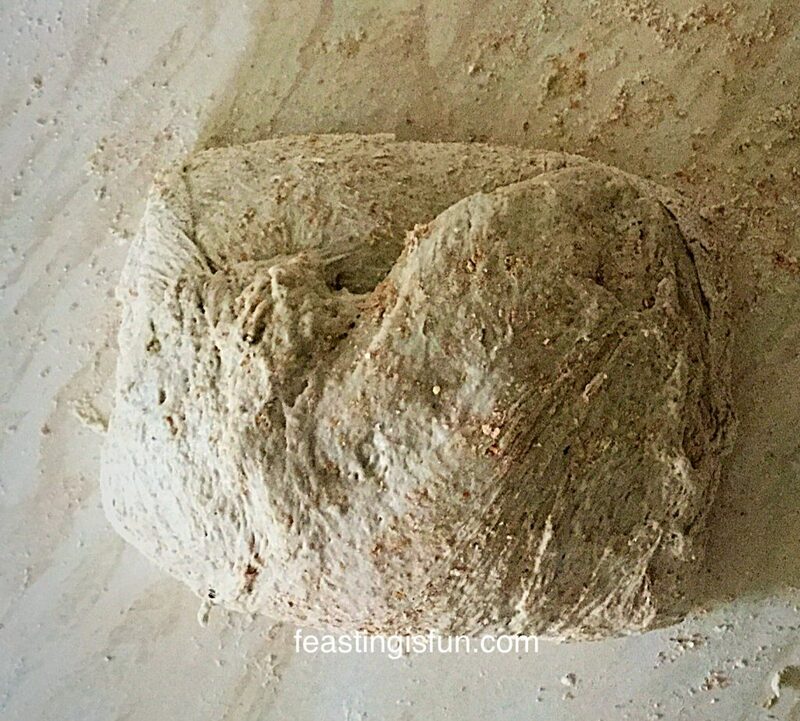 Bake the Lighter Wholemeal Loaf for 30 minutes. 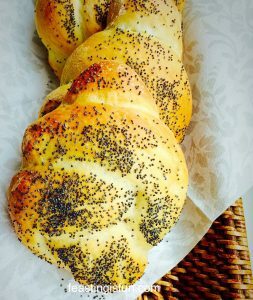 The bread is baked when it is a golden brown colour and sounds hollow when rapped on the base of the loaf with your knuckle. As soon as the bread is baked remove from the oven and immediately tip out onto a cooling rack. Note: If the loaf is baked but prefer a darker crust, place the loaf, without the tin, directly on to the oven shelf and bake for a further 5-10 minutes until the crust is the colour you desire. 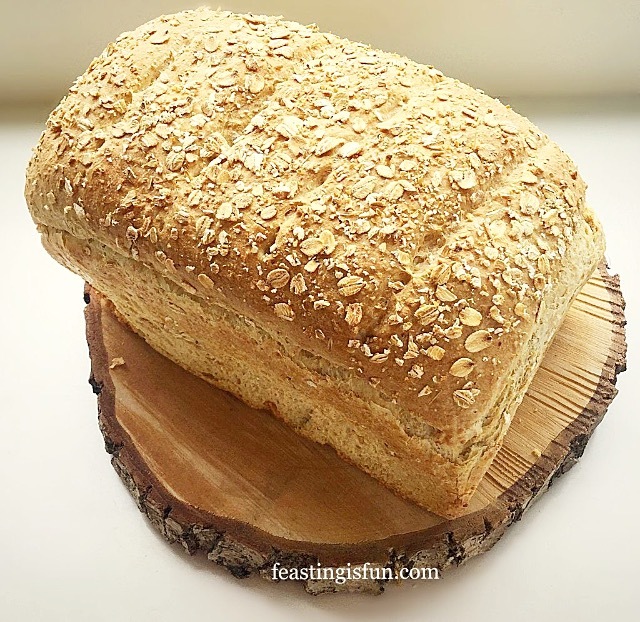 Lighter Wholemeal Loaf such a delicious and versatile bread. The smell of freshly baked bread is so unbelievably good. Our postman really likes delivering to us in the morning, as that tends to be when the bread is either baking or cooling! 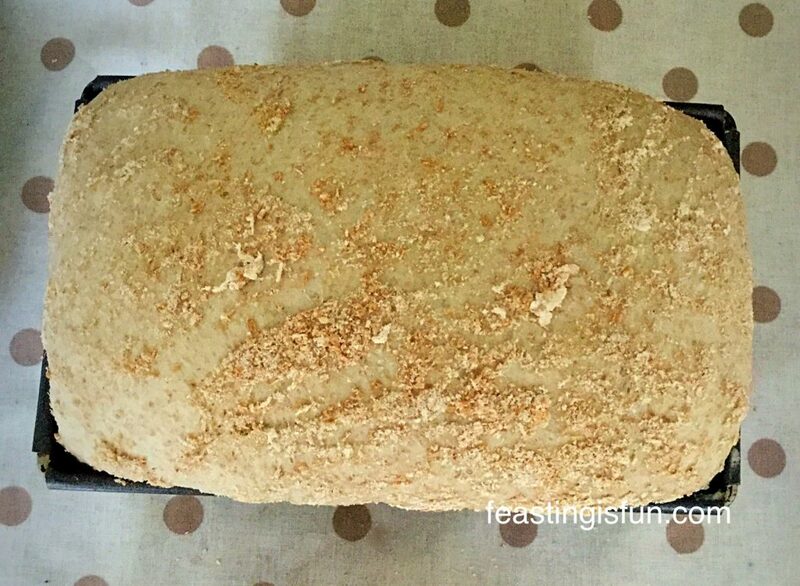 This Lighter Wholemeal Loaf will keep in a bread bin for up to 3 days. To freeze, ensure the bread is completely cold and wrap tightly in cling film. Fresh bread can be frozen for up to 3 months. 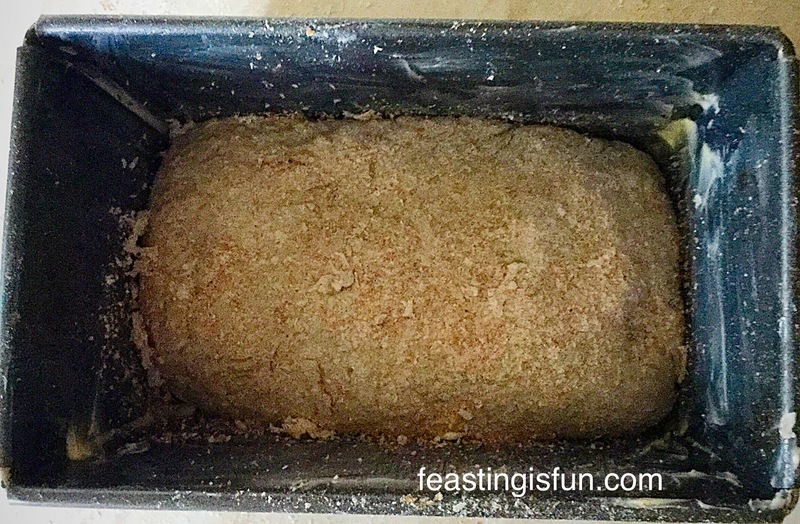 To defrost, remove all the cling film and allow the loaf to stand on a large trivet or a cooling rack at room temperature, until fully defrosted. Knotted Poppyseed Rolls perfect for picnics. Using a bread maker or stand mixer to carry out the kneading part of making bread dough isn’t cheating. I hand kneaded some incredibly sticky Brioche dough for 20 minutes at the weekend and honestly, it has really taken it’s toll on my body this week. So if using kitchen appliances enables us to eat better quality, homemade bread, that is also much cheaper than it’s shop bought counterpart, why not? 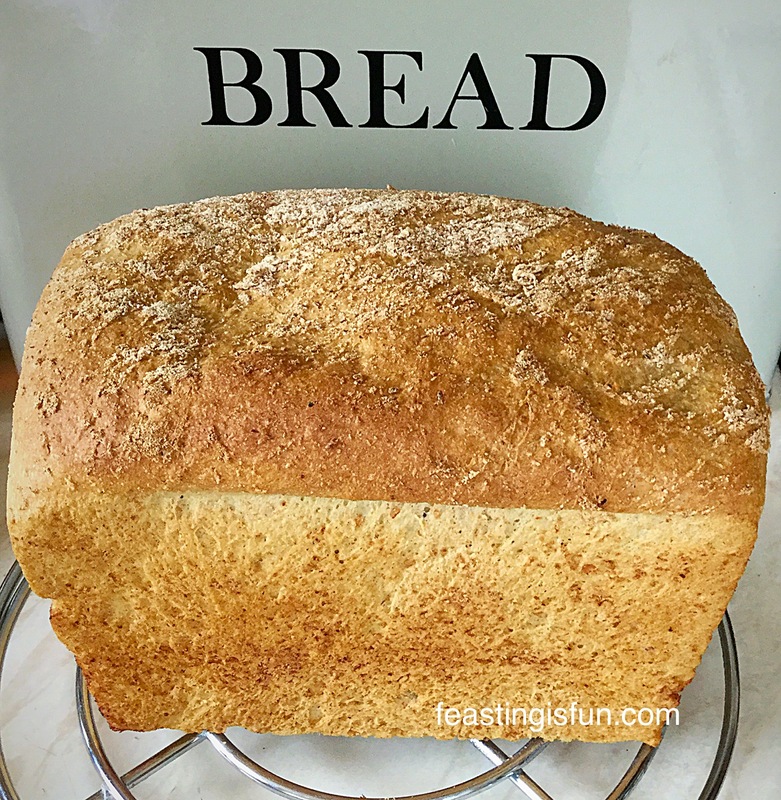 I hope that the detailed, yet easy steps in this recipe have encouraged you to bake your own bread – you may find that once you start it is impossible to go back to mass produced, plastic wrapped loaves!! I am always willing to answer any questions you may have with this, or any of my other recipes. Simply leave a comment, or for a quicker reply Tweet me a message. Have fun making and baking in your kitchens, maybe invite a friend or neighbour round and bake together. It may take longer but I can guarentee there will be lots of laughing. This is not a sponsored post. I have been buying Shipton Mill flour for almost as long as I have been baking my own bread. I adore whole wheat bread—and yours looks perfect for sandwiches, toast, and just sliced with butter! YUM!! Love your Bread baking Sammie. It’s inspired me to buy the 3lb loaf tin, you use. Hola también a mi me encanta hornear m iu pan desde qué lo hice no compré más en las panaderías, es tan diferente el sabor y la calidad. Voy a comprar el molde que tienes me encanta. Gracias por compartir tus secretos y conocimientos tus recetas son fabulosos . Previous Previous post: Hearty Minestrone Soup.